We believe that you have a right to know, ahead of time, exactly what information we might collect from you, why we collect it and how we use it. 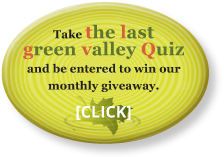 We collect personal information that you choose to provide voluntarily when using The Last Green Valley web site to become a member, make a donation to the organization, register for a program or event, send an inquiry, or enter a contest. We may also ask for personal information when you contact the staff in our office. This will allow us to protect your confidentiality by verifying your identity. When you make a transaction using a credit card, we collect your name, your billing address for the card, email address, the card type, number, security verification code and expiration date. We collect this information in order to complete your transaction. We also collect information that allows us to mail or email necessary information to you, including name, address, email address and phone number. Register you as a member of The Last Green Valley, Inc.
We never sell or rent your personal information to any parties under any circumstances. We will share personal information only within our organization for limited purposes, including notification of events and news, providing member services, and completing credit card transactions. Aside from the purposes described above, we will never share your personal information with any parties unless we have your express permission or under special circumstances, such as when we believe in good faith that the disclosure is required by law. We may share aggregated demographic and statistical information with our partners. This is not linked to any personal information that can identify any individual. The security of your personal information is very important to us. Your personal information will be automatically encrypted, or encoded, before it is sent over the Internet. When you enter a secure portion of our site a closed lock or solid key should appear in the bottom bar of your browser window. This guarantees that your personal information is being transmitted in secure (encrypted) form. Credit card information is transmitted directly to the credit card processor and is not stored on The Last Green Valley web server. We realize that making transactions on our Last Green Valley web site, or any other web site, requires trust on your part. We value your trust and pledge to you that we will work to protect the security and privacy of any personal information you provide to us and that your personal information will only be used as set forth in this Policy. We reserve the right to change, modify or amend this policy at any time. If we make any change to this policy, we will post notice of the change on The Last Green Valley web site for a period of at least six months after the change is implemented.